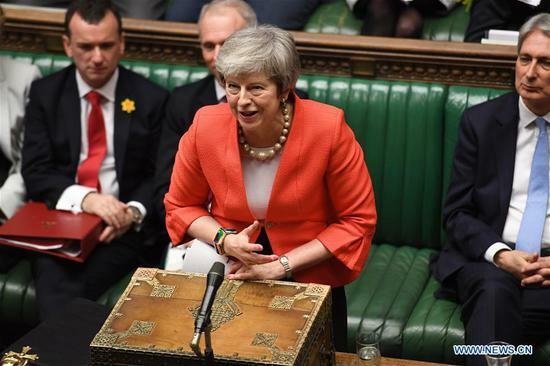 LONDON, March 11 (Xinhua) -- British Prime Minister Theresa May on Monday secured "legally binding" changes to her Brexit deal just less than 24 hours before a meaningful vote in the parliament on it, according to senior British official here. David Lidington, the British Cabinet Office minister, told the House of Commons that the parliament will vote on this "improved" deal on Tuesday. The changes "strengthen and improve" the withdrawal agreement that will see the UK leave the EU, as well as its future relationship with the bloc, said Lidington, who is the prime minister's de facto deputy. May, who is fighting to save her Brexit deal with the European Union (EU), arrived in Strasbourg late Monday for last-ditch talks with senior EU officials in order to have the withdrawal agreement passed in the parliament. At a press conference in Strasbourg, Jean-Claude Juncker, the president of the European Commission, said that the Irish backstop, the bilateral agreement aimed at avoiding a harder border between Northern Ireland and the Republic of Ireland, is "an insurance policy." Also speaking at the press conference, May said that the latest agreement is legally binding, just like the withdrawal agreement. The Democratic Unionist Party, a party from Northern Ireland which props up May's government, said Monday night that it will carefully study the latest EU-UK agreement. Earlier Monday, the European Commission voiced its hope that the members of parliament will back the EU-UK agreement, adding that it is up to them to decide what the country will do in next step on Brexit. The UK is due to leave the EU on March 29, but MPs rejected May's withdrawal deal by a large margin in January and demanded major changes. Before her Monday trip to the European continent, May has failed to secure significant concessions from Brussels. If May's deal is voted down on Tuesday in the parliament, she then faces a possible defeat on a second vote on Wednesday to prevent a no-deal Brexit on March 29, and a third vote on Thursday to extend the Article 50 divorce process -- likely until the end of June. Lidington said the British government would Monday night lay two new documents to the House of Commons -- a joint legally binding instrument on the withdrawal agreement and a joint statement to supplement the political declaration on Britain's future relationship with the EU. The so-called breakthrough came after what were described as last throw of the dice by May to save her Brexit deal. Throughout Monday, the political landscape continually changed as politicians predicted May would lose Tuesday's vote by as many as 150 votes. When May presented her deal to MPs in January it lost by 230, the biggest defeat in British political history. Opponents to her deal, especially in her Conservative Party, say they will never accept a deal that risks keeping Britain allied to EU rules. May and her government now face a waiting game to see how parliament will react to the latest developments. May is to open a debate in the House of Commons Tuesday that will conclude Tuesday night with a vote on the "improved" deal she has brokered with the EU on Britain's relationship after it ends its membership of the regional bloc. Keir Starmer, chief Brexit spokesman for the main opposition Labour Party, said meanwhile he expected MPs from his party to reject the deal in Tuesday's vote. The Daily Telegraph newspaper in London described Monday as a day of "frenetic diplomacy" ahead of Tuesday's parliamentary vote. The Irish government's cabinet also held an unscheduled meeting Monday evening to discuss Brexit as events unfolded in Strasbourg. The border between Ireland and Northern Ireland had been the major stumbling block on the quest to find a Brexit deal agreeable to both Britain, Ireland and the EU.